How to access AMI-audio podcasts | Accessible Media Inc.
We’re excited to make our content available to you on more platforms you want to access. Recent research has indicated that AMI’s core audience, the blind and partially sighted community, regularly incorporates podcasts as part of its media consumption. More than one-quarter of surveyed participants confirmed that they spend approximately one hour listening to podcasts each day – and that number is growing. Download podcasts of Live from Studio 5, The Pulse, Kelly and Company, Voices of The Walrus and more! Click here to learn more about all the programs AMI-audio offers. What platforms are AMI-audio podcasts available on? AMI-audio podcasts are available on all your favourite podcast apps and platforms. 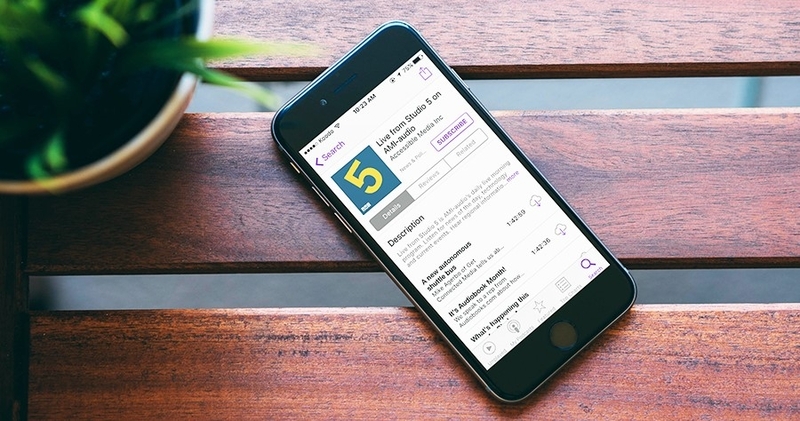 In collaboration with AMI-audio contributor Michael Feir, AMI-tv reporter Grant Hardy and Martin Courcelles, we've put together how-to guides on how to find our podcasts on these popular apps and platforms. Click on the links below to learn more about how to subscribe and download or stream AMI-audio podcasts! Listening to episodes of podcasts requires an Internet connection through the use of cellular or WiFi data. Downloading episodes while unconnected to WiFi will count against your cellular data plan. Grab the latest episodes while on WiFi whenever possible. Podcast clients or apps used to enjoy podcasts have settings which you are encouraged to be familiar with so decisions regarding the use of cellular data remain in your hands. Another area where these settings can help make your experience better is deciding whether to stream or download episodes. Downloading episodes stores them on your device where they can be played even while you're not connected to the Internet. This is optimal if you have enough storage space on your device. The other method is streaming episodes. This requires you to be connected to the Internet. Content is played on your device without being stored there. If storage space is limited, the ability to stream episodes lets you subscribe to podcasts without worrying about having enough free space for episodes. We want your feedback. Tell us what you think about these platforms. Are they accessible? Do you enjoy using them? Is there another app you use to download podcasts that you prefer? Email us at feedback@ami.ca or reach out to us on Twitter @AMIaudio and let us know what you think!